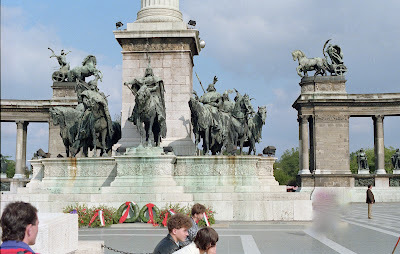 Budapest has survived Mongol invasions, Ottoman rule, Turkish occupation, the Austro-Hungarian Empire, two world wars, several revolutions, and a communist regime, each leaving its mark on this indestructible city. 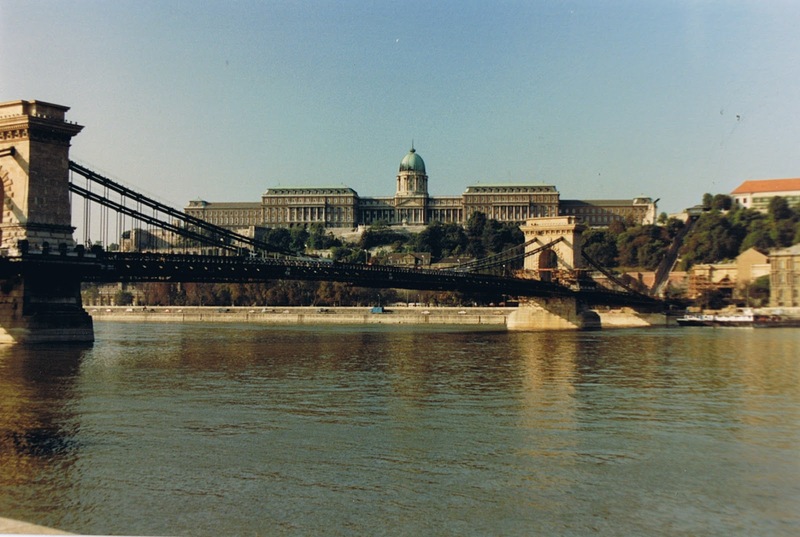 The river Danube, crossed by eight expansive bridges including the famously beautiful Chain Bridge, divides the metropolis of Budapest into its west bank, Buda, and its east bank, Pest, each with a number of tourist attractions, museums, and historical sights. 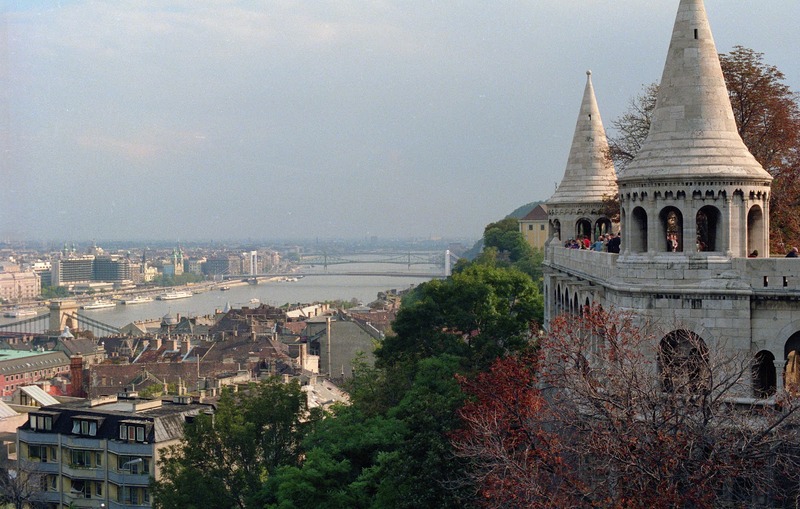 It's been a long time since I visited Budapest, Hungary, but the city still enchants me. I would love to take my children now in this post-Soviet era. 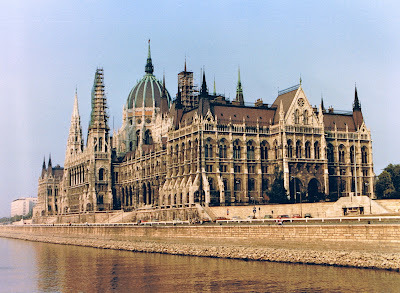 The most imposing structure in Budapest is without a doubt the enormous neo-Gothic parliament building, stretching 880 feet along the Pest embankment of the Danube. 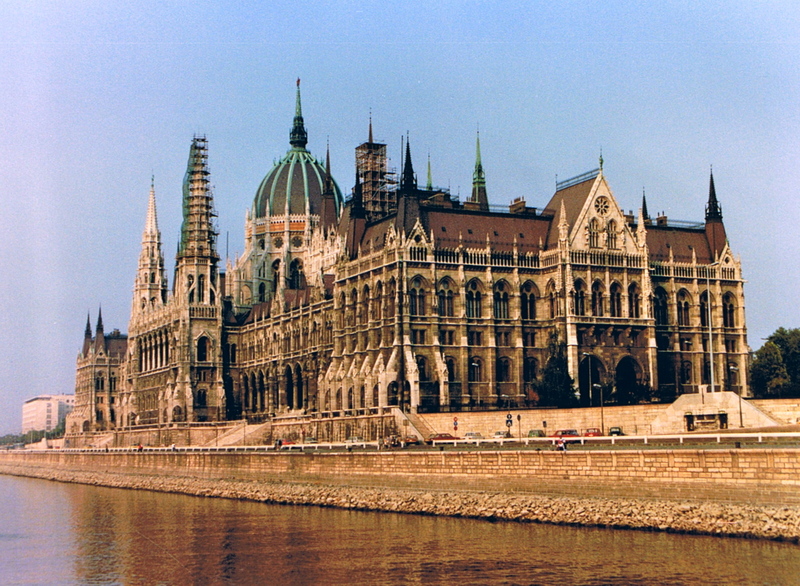 One of the oldest legislative buildings in Europe, this architectural jewel is ornamented with turrets, arches, and statues of Hungarian monarchs and military figures and can be toured inside. Guided tours in English are offered every day at 10:00, 12:00, and 2:00 p.m. 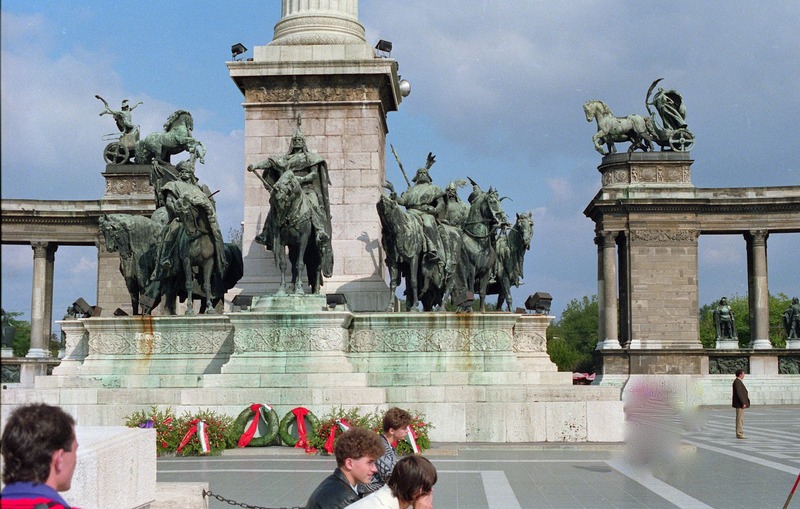 Heroes' Square is one of the most visited sights in Hungary's capital and is surrounded by City Park, the Museum of Fine Arts, and the Palace of Art. The Millennium Memorial in Heroes' Square is impressive with its tall column and seven mounted figures, two matched colonnades, and numerous statues of statesmen, angels and chariots. Ride up to medieval Castle Hill on the funicular (catch it on the Buda side of the Chain Bridge) and spend some time at my favorite sight, Fisherman's Bastion. Really just a lookout terrace with amazing views across the river to Pest, the white-stoned, fairy-tale structure with turrets, parapets, and climbing stairways is a beautiful place to stroll, picnic, and take photographs. 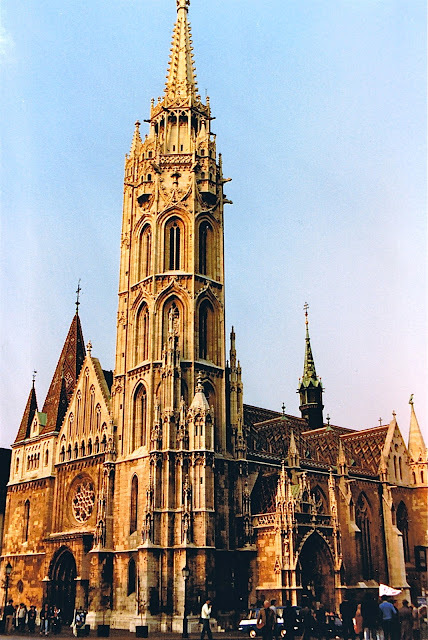 There are seven white cone-top towers, each one symbolizing one of the seven Magyar tribes that came to Hungary in 896. Patron saint St. Stephen astride his horse at Fisherman's Bastion. 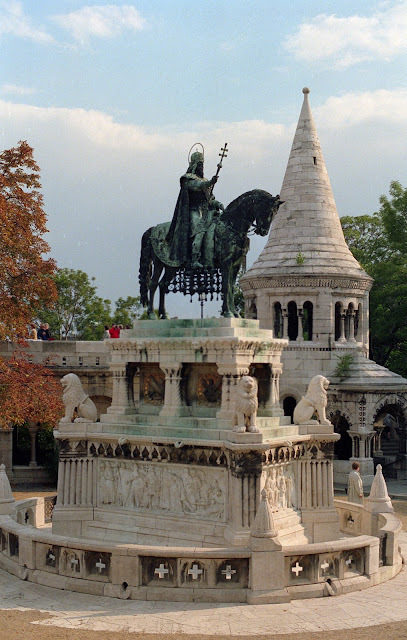 Don't miss the Royal Palace, also known as Buda Castle, on the southern tip of Castle Hill and all the medieval, baroque and 19th century houses, churches, and public buildings around it in the Várnegyed District. The Mattias Church is also a famous landmark here. 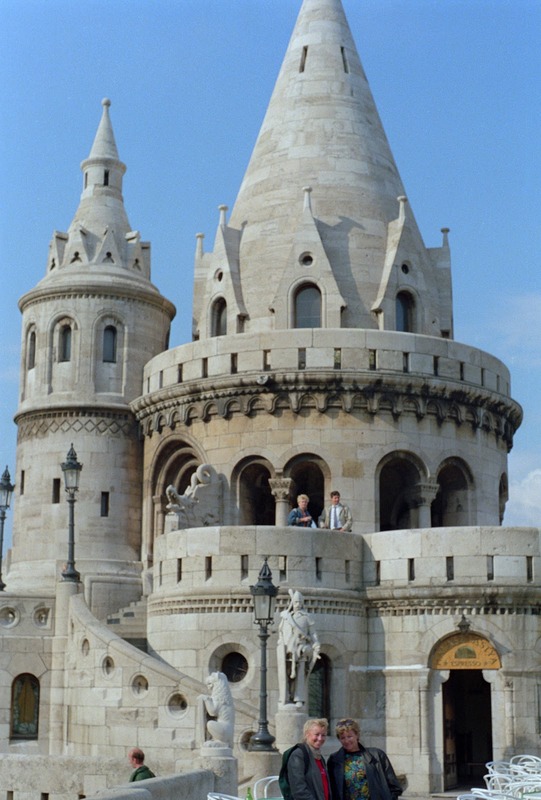 I won't be making any personal hotel recommendations in Budapest. I traveled there when the country was still behind the Iron Curtain and we were "assigned" to our overnight accommodations by a government official as soon as we arrived at the train station in Budapest. As budget travelers, we were directed to a residence in an old, unmaintained apartment building. The residence belonged to a middle-aged woman, who evidently lived alone there, and had a spare bedroom she either agreed to let out or perhaps - I don't know - was required to let out. She served us a meager breakfast every morning in her kitchen. (I wonder how much, if any, of the money we paid actually went to her, since we gave the money for the room to the government official who assigned us.) The day we left her apartment in Budapest she pleaded with us to buy some of her hand-embroidered doilies and asked for American dollars, if we had them. This experience, as well as a trip through East Germany, are the extent of my brush with Soviet Communism. 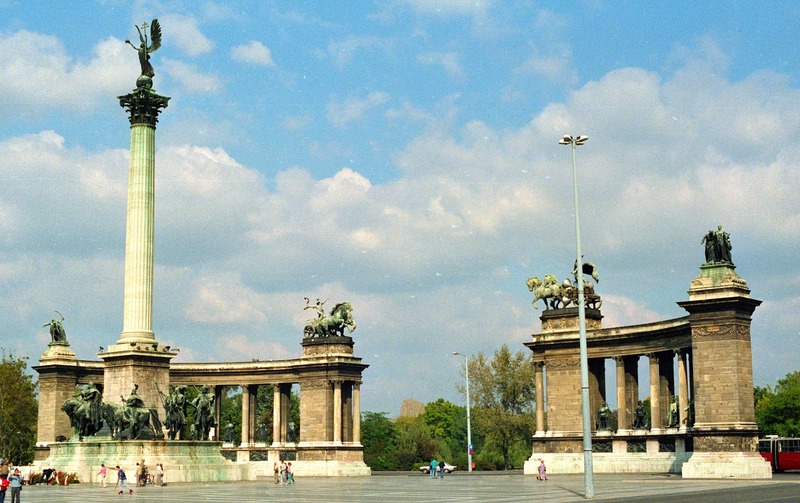 Prague and Budapest are apparently two of the extremely finest urban areas in Europe. With each giving its own blend of culture, history and advancement, it's nothing unexpected that sightseers are rushing to both urban areas in substantial measures. It's an eye-opening shock isn't it? Can we really, really not be without these methods of pest control?